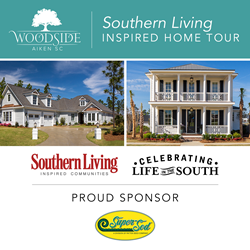 Super-Sod is a proud sponsor of Southern Living Inspired Homes at Woodside Communities. TifTuf's eco-friendly qualities help [Woodside Communities] remain good stewards to the enviroment. Super-Sod rolled out TifTuf, their most drought-tolerant Bermudagrass, as a sponsor of Woodside’s Southern Living Inspired Home Tour in Aiken, South Carolina. Woodside Community in Aiken, South Carolina, boasts Southern charm and tradition, but their most recent claim to fame is their hand-picked status as a Southern Living Inspired Community. To celebrate this status, Woodside is presenting a tour of homes with two newly built Southern Living Inspired Homes. Both homes will feature TifTuf Bermudagrass lawns. Developed at the University of Georgia and tested since 1991, TifTuf Bermudagrass uses 38 percent less water than standard Tifway Bermuda. National Turfgrass Evaluation Program research at universities across the U.S. indicates that TifTuf maintains its green color later into the fall months and greens up earlier in the spring than other Bermudagrasses. However, TifTuf isn’t just gracing the lawns of the new homes. Woodside is in the process of converting all residential and commercial lawns in the community to TifTuf Bermudagrass. The homes titled “The Polo at Summer Hill” and “The Savannah at the Village at Woodside” will be open for tours on Fridays, Saturdays and Sundays beginning on Friday, April 21, and concluding Memorial Day, May 29. Visitors will tour both homes and have the opportunity to learn about Woodside communities and culture, the construction of the houses and products used both inside and outside. Sponsors and contributors to the tours will also host display spaces within the Village Center, where visitors can pick up their tickets. Super-Sod will exhibit a booth with information about TifTuf, and a sod expert will be present each weekend to answer any questions about the drought-tolerant Bermudagrass. Tickets to the Southern Living Inspired Home Tour are $10 and available for purchase on-site or online at WoodsideCommunities.com. Tour hours are Fridays from 1 p.m. to 5 p.m., Saturdays from 10 a.m. to 5 p.m., and Sundays from 10 a.m. to 2 p.m. Special Memorial Day hours are 10 a.m. to 2 p.m. All ticket proceeds will benefit the following charities: Operation FinallyHOME, Saratoga WarHorse and The ALS Association. The Village Center — headquarters for the tour — is located at 230 Village Green Blvd., Aiken, South Carolina. More information on the tour and Woodside communities can be found at WoodsideCommunities.com. Super-Sod, a subsidiary of Patten Seed Company, is a family-run business that employs experts in turf and horticulture throughout the Southeast. Super-Sod continuously develops new garden products; fosters gardening and landscaping; and seeks improvement in farming practices, technology, environmental stewardship and employee knowledge. Learn more at SuperSod.com.